Gin Blossoms are an alternative rock band formed in 1987, in Tempe, Arizona, United States. The band originally consisted of Robin Wilson (vocals, guitar), Jesse Valenzuela (guitar, vocals), Doug Hopkins (guitar), Bill Leen (bass) and Phillip Rhodes (drums). Shortly after finishing their debut record "New Miserable Experience", the band fired Hopkins (who was also the band's principal songwriter and penned their hits "Found Out About You" and "Hey Jealousy") and replaced him with Scott Johnston. Sadly, Hopkins committed suicide in December of 1993. Rhodes left the band shortly after their 2002 reunion, and returned for a brief period in 2005. Currently the band does not have a permanent drummer. They took their name from a photo of W.C. Fields which bore the caption "W.C. Fields with gin blossoms," referring to the actor's gin-ravaged nose. The band, who were musically weaned on The Byrds and Tom Petty, released three albums and had several hits in the mid 1990s, before breaking up in 1997. Five years later in 2002, the band reunited, released a DVD, resumed touring, and promised a fourth album. 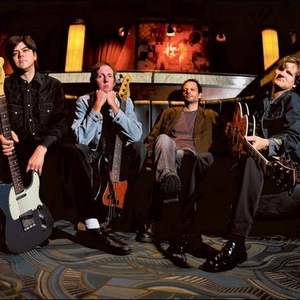 Major Lodge Victory, the Gin Blossoms' first album in ten years, was released on August 8, 2006 on the Hybrid Recordings label.